False nails have long been overdue a bit of a comeback. Remember when you used to stick a set on for a big night out and then wake up the next morning with one glued to your cheek? Ahhh, happy memories…. In recent times it’s been all about the stickers, foils, decals, and whatnots… the poor old falsie has taken a bit of a back seat! Things are set to change with a new collaboration between Elegant Touch and House of Holland. The British fashion designer’s creative eye has been cast into the beauty realm and you’ll soon be able to sport some of his eyecatching creations on your fingertips. I know it’s not something I should be fixating on, but I love the packaging very much indeed… perhaps even more than the nails? That’s so wrong, isn’t it? Shy, retiring types need not apply but I do have a bit of a nail crush on Heart Breaker, that painted tip shape is something I could only dream of being able to apply with actual polish. 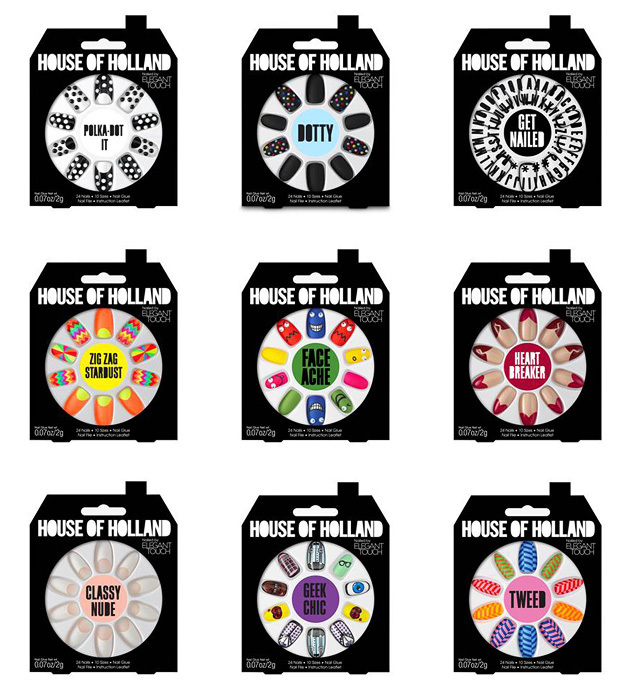 House of Holland Nails by Elegant Touch will be available next month instore and online at both Boots and Superdrug. The sets will be priced between £7.99-£8.99.